The Interactive Notebook has become a large part of many classrooms around the country. It is typically divided into two sides (left side and right side). •The right side of the notebook is used for INPUT. This side is for the student to record notes and “testable” information. It is typically information that is provided by the teacher, such as class notes. But it can also be diagrams or maps, vocabulary, graphic organizers, handouts, etc. •The left side of the notebook is used for OUTPUT. This side is for students to process new ideas. It can be a review of what they already know or thinking about new information. It is also a place for students to show their understanding of the information learned in class. It can include creative drawings, ideas, or writing. It is simply a way to wrap up the lesson or summarize. 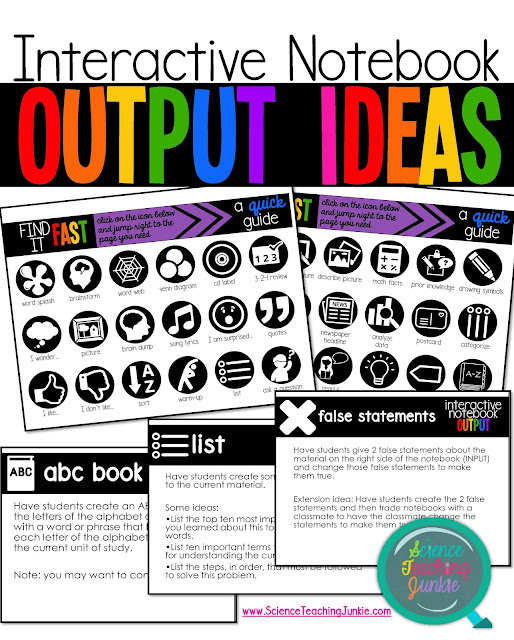 The OUPUT side of the Interactive Notebook is something that I am constantly struggling with in my own classroom. I either run out of time or forget to allow my students the opportunity to reflect and process their learning. I know — worst teacher ever, right?!? But, I know I am not alone. (Simply typing this makes me feel less guilty somehow.) I get a lot of questions from teachers around the country about how to do this or what method(s) I suggest.